MASS began while the Power family were living in Krakow during the autumn and winter of 2010-11. I wanted to make a new body of work in Poland, in the wake of The Sound of Two Songs, but with a more specific (and intimate) subject matter. I was drawn to a religious theme in spite of - or more likely because of - being a lapsed Catholic. 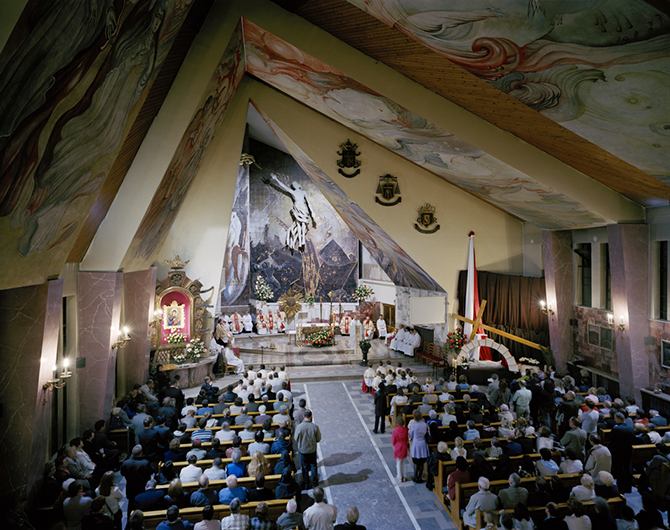 Finally completing the work in late 2012, MASS seeks to investigate the phenomenon of the Polish Catholic church and an intensity of faith which appears to cross borders of both class and age... often in settings of spectacular beauty. Photographed from the 'Organista' (the raised area at the back of the church where the organist sits) during busy services, each 'Mass' image is paired with a close-up of a 'slot' found in the same church, into which the congregation are encouraged to put what little money they might have.